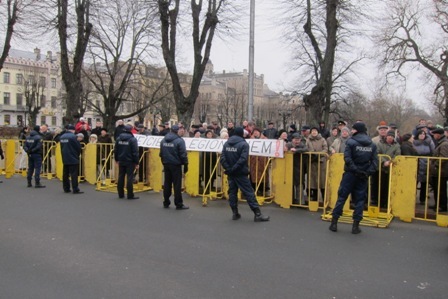 In RIGA (Latvia) around 1500 people participated on 16 March 2012 to the ceremony hold in the city-center Liberty's Monument, honoring the Latvian Waffen SS. The event was protected by about 1000 policemen. After the end of Communism, many East European governments have boosted their far-right ultranationalist policies with concomitant anti-Semitic, racist and Nazi-glorifying demonstrations. After the March of the Nazis during the National independence day in Lithuania a few day ago, this is now the turn of Latvia. One month before, the European Commission released its report condemning the Waffen SS marches as incompatible with European values. 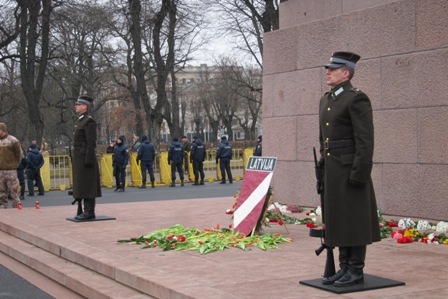 The Latvian president praised the Latvian Waffen SS and said that the world should “bow their heads” in their respect. The question is now raised : Why the European Community do not expel countries which do not respect its basic values such as the Baltic countries or Hungary?